HandReach has been honored once again with the prestigious 2014 Top-Rated Award by GreatNonprofits, the leading provider of user reviews about nonprofit organizations. HandReach is grateful for support from MassMutual in supporting the HandReach BeatBrigade that engages youth in providing therapeutic drumming for children recovering from trauma injuries. MassMutual employees joined HandReach at the Shriners Walkathon in Springfield, MA in 2012 to engage Shriners patients and families in community drumming. 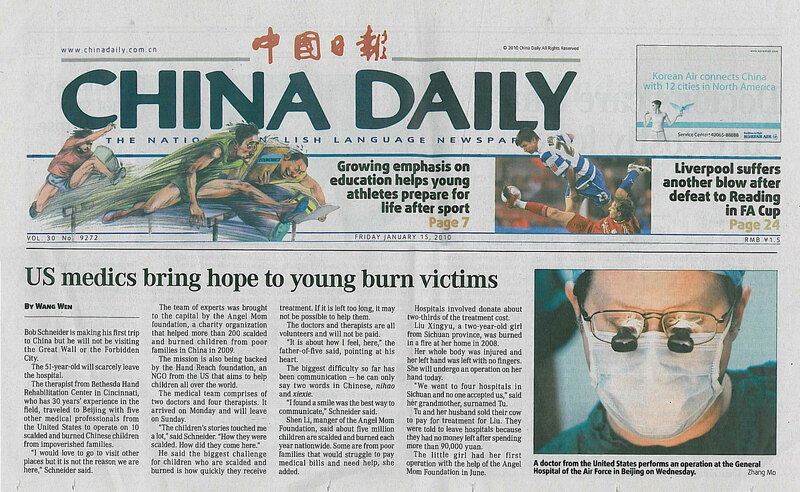 Houston Chronicle: "Surgeons Bring New Hope to Family of Burned Chinese Kids"
HandReach spent years working to get proper burn treatment for little Min Tang and her brother Ze, two children who lost multiple limbs in a devastating house fire in their native Yunnan Province. Min literally ran into the fire to save her baby brother, covering his small body with her own as they fled the burning home. The siblings' complex burn injuries were left untreated until HandReach found Galveston Shriners. An in-depth look at HandReach's first inaugeral international medical co-op program with Northeastern University and our Chinese hospital partners. A glimpse at HandReach's programs and activities during our July 2010 Psychosocial Camp/Clinic, which took place over a two-week period in Changsha and Beijing, China. "US Medics Bring Hope to Young Burn Victims"
A look at Zhou Lin Swartz's current life and successes before departing on HandReach's July 2010 Psychosocial Camp/Clinic. One of America's top plastic surgeons recounts his personal and professional experiences in China during HandReach's January 2010 Surgical Clinic. "The Wounded Dragon: American NGOS at Work in China"
This article profiles the work HandReach is doing to assist those in China most in need. "A New Life, Step by Step"
This article details the unique relationship between HandReach Director Brecken Swartz and her now adopted daughter Zhou Lin. Zhou Lin was badly injured in a kerosene explosion, but Brecken and HandReach have dedicated themselves to giving her a better life.